Soul Yoga Fest has expanded our emphasis to include more natural food vendors, workshops in vegan and raw food preparation as well as more dance, martial arts and other types of movement arts. 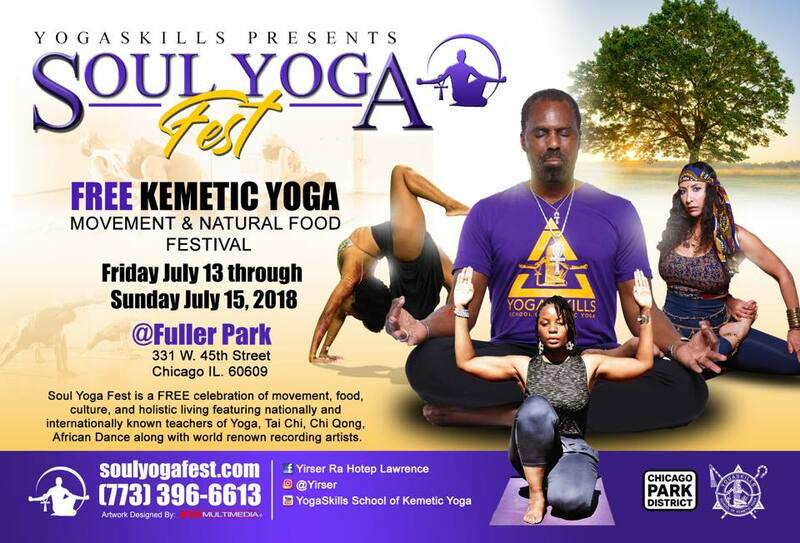 The annual Yoga festival which was created by Master Kemetic Yoga Instructor and founder of the global Kemetic Yoga Movement, Yirser Ra Hotep-Lawrence to introduce Yoga, especially Kemetic Yoga from the cultural perspective of Africa, to communities that otherwise would not know of Yoga, do not have access to it, nor know of its African and Kemetic (ancient Egyptian) roots. Soul Yoga Fest is held in Chicago, Atlanta, Las Vegas, Paris, South Africa and Jamaica. Soul Yoga Fest is open to all persons interested in Yoga, Meditation, Health, Nutrition, and Fitness.